 Please be advised that the President's New Freedom Commission on Mental Health, established in April 2002, ended on April 29, 2003. This site has been archived by the University of North Texas Libraries. If you have technical difficulties, please let us know. If you have any questions about the contents of this website, please contact the Substance Abuse and Mental Health Services Administration's (SAMHSA), Office of Communications at 301-443-8956. To obtain assistance accessing mental health information or referrals to a local treatment facility or other resources, please contact the National Mental Health Information Center (MHIC). The National Mental Health Information Center was developed for users of mental health services and their families, the general public, policy makers, providers, and the media. Information Center staff members are skilled at listening and responding to questions from the public and professionals. The staff quickly directs callers to Federal, State, and local organizations dedicated to treating and preventing mental illnesses. To reach MHIC directly, call 800-789-2647, email info@mentalhealth.org, or click on the following website link: www.mentalhealth.samhsa.gov.